Chronic myelogenous leukaemia CML results from the neoplastic transformation of a haematopoietic stem cell. The hallmark genetic abnormality of CML is a t(9;22)(q34;q11) translocation, which was first discovered as an abnormal, small chromosome, named the Philadelphia chromosome. This translocation generates the BCR - ABL fusion gene. The initial chronic phase of this biphasic disease is characterized by a massive expansion of the granulocytic cell lineage, even though most, if not all, haematopoietic lineages can be produced from the CML stem cell. The median duration of the chronic phase is 3-4 years. Acquisition of additional genetic and/or epigenetic abnormalities causes the progression of CML from chronic phase to blast phase. This phase is characterized by a block of cell differentiation that results in the presence of 30% or more myeloid or lymphoid blast cells in peripheral blood or bone marrow, or the presence of extramedullary infiltrates of blast cells. The discovery that BCR-ABL is required for the pathogenesis of CML, and that the tyrosine-kinase activity of ABL is essential for BCR-ABL-mediated transformation, made the ABL kinase an attractive target for therapeutic intervention. Imatinib mesylate (Glivec, previously known as STI571 and CGP 57148) — a potent inhibitor of the tyrosine kinases ABL, ARG, platelet-derived growth factor receptor and KIT — has been shown to selectively induce apoptosis of BCR-ABL+ cells, and is remarkably successful in treating patients with CML. Human Abl is a ubiquitously expressed 145-kd protein with 2 isoforms arising from alternative splicing of the first exon. Several structural domains can be defined within the protein (Figure 2). Three SRC homology domains (SH1-SH3) are located toward the NH2 terminus. The SH1 domain carries the tyrosine kinase function, whereas the SH2 and SH3 domains allow for interaction with other proteins. Proline-rich sequences in the center of the molecule can, in turn, interact with SH3 domains of other proteins, such as Crk. Toward the 39 end, nuclear localization signals and the DNA-binding and actin-binding motifs are found. Thus, the normal Abl protein is involved in the regulation of the cell cycle, in the cellular response to genotoxic stress, and in the transmission of information about the cellular environment through integrin signaling. Overall, it appears that the Abl protein serves a complex role as a cellular module that integrates signals from various extracellular and intracellular sources and that influences decisions in regard to cell cycle and apoptosis. The 160-kd Bcr protein, like Abl, is ubiquitously expressed. Several structural motifs can be delineated (Figure 3). The first N-terminal exon encodes a serine–threonine kinase. The only substrates of this kinase identified so far are Bap-1, a member of the 14-3-3 family of proteins, and possibly Bcr itself. A coiled–coil domain at the N-terminus of Bcr allows dimer formation in vivo. The center of the molecule contains a region with dbl-like and pleckstrin-homology (PH) domains that stimulate the exchange of guanidine triphosphate (GTP) for guanidine diphosphate (GDP) on Rho guanidine exchange factors, which in turn may activate transcription factors such as NF-kB. The C-terminus has GTPase activity for Rac, a small GTPase of the Ras superfamily that regulates actin polymerization and the activity of an NADPH oxidase in phagocytic cells. In addition, Bcr can be phosphorylated on several tyrosine residues, especially tyrosine 177, which binds Grb-2, an important adapter molecule involved in the activation of the Ras pathway. The BCR-ABL chimeric protein is thought to play a central role in the pathogenesis of Philadelphia (Ph) chromosome-positive leukemias, notably chronic myeloid leukemia (CML). There is compelling evidence that malignant transformation by BCR-ABL is critically dependent on its protein tyrosine kinase (PTK) activity. As a result, multiple signaling pathways are activated in a kinase-dependent manner, and thus the activation of such pathways may affect the expression of genes that confer the malignant phenotype. Depending on the location of the breakpoint in BCR, three types of fusion protein can be formed, all of which exhibit deregulated PTK activity compared to normal ABL. As a result, there is excessive tyrosine phosphorylation of many intracellular proteins including the BCR-ABL protein itself. Although not all interactions of BCR-ABL with other proteins are phosphotyrosine dependent, it is clear from mutational analysis that the PTK activity is an absolute requirement for malignant transformation, and that it cannot be complemented by any downstream effector. In contrast, it is, at present, less clear which of the various signaling pathways activated by BCR-ABL (such as RAS), Janus-activated kinase-signal transducers and activators of transcription and phosphatidylinositol 39-kinase is essential for transformation. Basic mechanisms that have been attributed to BCR-ABL-positive cells, particularly in CML, are increased proliferation, increased resistance to apoptosis, and an alteration of their adhesion properties. The breakpoints within the ABL gene at 9q34 can occur anywhere over a large (greater than 300 kb) area at its 59 end, either upstream of the first alternative exon Ib, downstream of the second alternative exon Ia, or, more frequently, between the two35 (Figure 4). a 190-kd protein (P190 BCR-ABL). Recently, a third breakpoint cluster region (m-bcr) was identified downstream of exon 19, giving rise to a 230-kd fusion protein (P230 BCR-ABL) associated with the rare Ph-positive chronic neutrophilic leukemia, though not in all cases. Two recent reports showed that the physical distance between the BCR and the ABL genes in human lymphocytes and CD341 cells is shorter than might be expected by chance; such physical proximity could favor translocation events involving the 2 genes. However, the presence of the BCR-ABL translocation in a hematopoietic cell is not in itself sufficient to cause leukemia because BCR-ABL fusion transcripts of M-bcr and m-bcr type are detectable at low frequency in the blood of many healthy individuals. ABL is a non-receptor tyrosine kinase that is expressed in most tissues. In cells, the ABL protein is distributed in both the nucleus and cytoplasm of cells and can shuttle between the two compartments. It transduces signals from cell-surface growth factor and adhesion receptors to regulate cytoskeleton structure. BCR is also a signalling protein that contains multiple modular domains. The fusion of BCR sequences to ABL during the translocation associated with CML increases the tyrosine-kinase activity of ABL, and brings new regulatory domains/motifs to ABL, such as the growth factor receptor-bound protein 2 GRB2 SH2-binding site (FIG. 5). Depending on the precise breakpoints in the translocation and RNA splicing, different forms of BCR–ABL protein with different molecular weights (p185 BCR-ABL, p210 BCR–ABL and p230 BCR–ABL) can be generated in patients. Expression of BCR–ABL in human CD34+ cells causes increased proliferation in response to growth factors, increased growth-factorindependent survival, reduced adhesion to fibronectina and reduced chemotaxis to stroma-derived factor- 1α22,23. These properties of BCR–ABL-expressing human haematopoietic progenitor cells mimic those of CML progenitor cells isolated from patients. Leukaemogenic signalling of BCR–ABL. The p210 form of BCR–ABL is shown in this diagram The BCR–ABL proteins can form dimers or tetramers through their CC domains, and trans-autophosphorylate (indicated by up and down arrows between protein structures). Phosphorylation at the Y177 residue generates a high-affinity binding site for growth factor receptor-bound protein 2 (GRB2). GRB2 binds to BCR–ABL through its SH2 domain and binds to SOS and GRB2-associated binding protein 2 (GAB2) through its SH3 domains. SOS in turn activates RAS. Following phosphorylation (P) by BCR–ABL, GAB2 recruits phosphatidylinositol 3-kinase (PI3K) and SHP2 proteins. The SH2 domain of ABL can bind SHC, which, following phosphorylation can also recruit GRB2. The ABL SH3 domain and the SH3 binding sites in the carboxy-terminal region can bind several proteins that involve regulations of cell adhesion/migration. Interferon consensus sequence binding protein (ICSBP), also known as interferon regulatory factor 8, negatively regulates proliferation and survival of myeloid cells by inducing differentiation of monocytic cells. JUNB inhibits cell proliferation and survival, partly by antagonizing the RAS downstream target JUN. SIPA1 (signal-induced proliferation-associated gene-1) is a RAP1 GAP that keeps RAP1 inactive. BCR–ABL can promote cell proliferation and survival partly by activating the RAS, SHP2 and PI3K–AKT signaling pathways. It can also downregulate transcription of ICSBP and JUNB, and might also inhibit SIPA1. Three major mechanisms have been implicated in the malignant transformation by Bcr-Abl, namely altered adhesion to stroma cells and extracellular matrix, constitutively active mitogenic signaling and reduced apoptosis. A fourth possible mechanism is the recently described proteasome-mediated degradation of Abl inhibitory proteins. CML progenitor cells exhibit decreased adhesion to bone marrow stroma cells and extracellular matrix. In this scenario, adhesion to stroma negatively regulates cell proliferation, and CML cells escape this regulation by virtue of their perturbed adhesion properties. Interferon-a (IFN-a), an active therapeutic agent in CML, appears to reverse the adhesion defect. Recent data suggest an important role for b-integrins in the interaction between stroma and progenitor cells. CML cells express an adhesion-inhibitory variant of b1 integrin that is not found in normal progenitors. On binding to their receptors, integrins are capable of initiating normal signal transduction from outside to inside; it is thus conceivable that the transfer of signals that normally inhibit proliferation is impaired in CML cells. Because Abl has been implicated in the intracellular transduction of such signals, this process may be further disturbed by the presence of a large pool of Bcr-Abl protein in the cytoplasm. Furthermore, Crkl, one of the most prominent tyrosine-phosphorylated proteins in Bcr-Abl–transformed cells, is involved in the regulation of cellular motility and in integrin-mediated cell adhesion by association with other focal adhesion proteins such as paxillin, the focal adhesion kinase Fak, p130Cas, and Hef1. Has recently been demonstrated that Bcr-Abl tyrosine kinase upregulates the expression of a6 integrin mRNA, which points to transcriptional activation as yet another possible mechanism by which Bcr-Abl may have an impact on integrin signaling. Thus, though there is sound evidence that Bcr-Abl influences integrin function, it is more difficult to determine the precise nature of the biologic consequences, and, at least in certain cellular systems, integrin function appears to be enhanced rather than reduced by Bcr-Abl. binding of Crkl to Bcr-Abl is not required for the transformation of myeloid cells. Circumstantial evidence that Ras activation is important for the pathogenesis of Ph-positive leukemias comes from the observation that activating mutations are uncommon, even in the blastic phase of the disease, unlike in most other tumors. 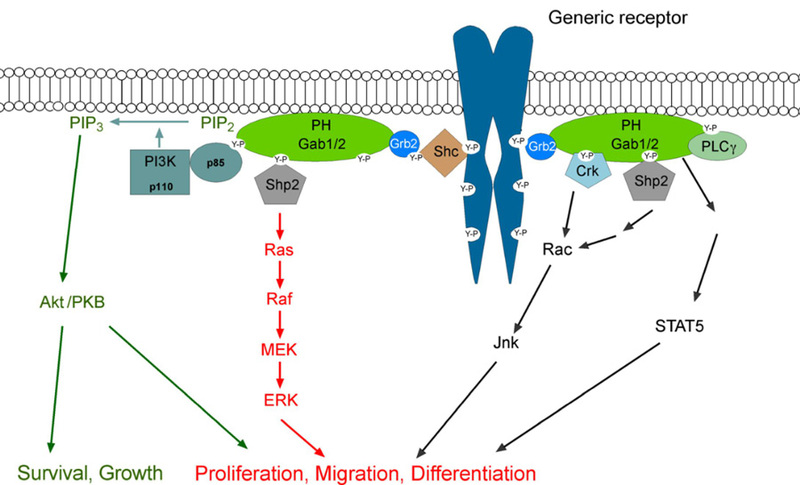 Activation of the Jnk/Sapk pathway by Bcr-Abl has been demonstrated and is required for malignant transformation; thus, signaling from Ras may be relayed through the GTP–GDP exchange factor Rac to Gckr (germinal center kinase related) and further down to Jnk/Sapk. Jak-Stat pathway. The first evidence for involvement of the Jak- Stat pathway came from studies in v-abl–transformed B cells. Constitutive phosphorylation of Stat transcription factors (Stat1 and Stat5) has since been reported in several BCR-ABL–positive cell lines and in primary CML cells,and Stat5 activation appears to contribute to malignant transformation. Although Stat5 has pleiotropic physiologic functions, its effect in BCR-ABL–transformed cells appears to be primarily anti-apoptotic and involves transcriptional activation of Bcl-xL. In contrast to the activation of the Jak-Stat pathway by physiologic stimuli, Bcr-Abl may directly activate Stat1 and Stat5 without prior phosphorylation of Jak proteins. There seems to be specificity for Stat6 activation by P190BCR-ABL proteins as opposed to P210BCR-ABL. The role of the Ras and Jak-Stat pathways in the cellular response to growth factors could explain the observation that BCR-ABL renders a number of growth factor–dependent cell lines factor independent. In some experimental systems there is evidence for an autocrine loop dependent on the Bcr-Abl–induced secretion of growth factors, and it was recently reported that Bcr-Abl induces an IL-3 and G-CSF autocrine loop in early progenitor cells. Interestingly, Bcr-Abl tyrosine kinase activity may induce expression not only of cytokines but also of growth factor receptors such as the oncostatin M b receptor. One should bear in mind, however, that during the chronic phase, CML progenitor cells are still dependent on external growth factors for their survival and proliferation, though less than normal progenitors. FDCPmix cells transduced with a temperature-sensitive mutant of BCR-ABL have a reduced requirement for growth factors at the kinase permissive temperature without differentiation block.126 This situation resembles chronic-phase CML, in which the malignant clone has a subtle growth advantage while retaining almost normal differentiation capacity. PI3 kinase pathway. PI3 kinase activity is required for the proliferation of BCR-ABL–positive cells. Bcr-Abl forms multimeric complexes with PI3 kinase, Cbl, and the adapter molecules Crk and Crkl, in which PI3 kinase is activated. The next relevant substrate in this cascade appears to be the serine–threonine kinase Akt. This kinase had previously been implicated in antiapoptotic signaling. A recent report placed Akt in the downstream cascade of the IL-3 receptor and identified the pro-apoptotic protein Bad as a key substrate of Akt. Phosphorylated Bad is inactive because it is no longer able to bind anti-apoptotic proteins such as BclXL and it is trapped by cytoplasmic 14-3-3 proteins. Altogether this indicates that Bcr-Abl might be able to mimic the physiologic IL-3 survival signal in a PI3 kinase-dependent manner. Ship131 and Ship-2,132 2 inositol phosphatases with somewhat different specificities, are activated in response to growth factor signals and by Bcr-Abl. Thus, Bcr-Abl appears to have a profound effect on phosphoinositol metabolism, which might again shift the balance to a pattern similar to physiologic growth factor stimulation. mutant suppresses transformation. The pathway linking Myc to the SH2 domain of Bcr-Abl is still unknown. However, results obtained in v-abl–transformed cells suggest that the signal is transduced through Ras/Raf, cyclin-dependent kinases (cdks), and E2F transcription factors that ultimately activate the MYC promoter. It seems likely that the effects of Myc in Ph-positive cells are probably not different from those in other tumors. Depending on the cellular context, Myc may constitute a proliferative or an apoptotic signal. It is therefore likely that the apoptotic arm of its dual function is counterbalanced in CML cells by other mechanisms, such as the PI3 kinase pathway. Expression of Bcr-Abl in factor-dependent murine and human cell lines prevents apoptosis after growth-factor withdrawal, an effect that is critically dependent on tyrosine kinase activity and that correlates with the activation of Ras. Moreover, several studies showed that BCR-ABL–positive cell lines are resistant to apoptosis induced by DNA damage. The underlying biologic mechanisms are still not well understood. Bcr-Abl may block the release of cytochrome C from the mitochondria and thus the activation of caspases. This effect upstream of caspase activation might be mediated by the Bcl-2 family of proteins. Bcr-Abl has been shown to up-regulate Bcl-2 in a Ras or a PI3 kinase-dependent manner in Baf/3 and 32D cells, respectively. Moreover, as mentioned previously, BclxL is transcriptionally activated by Stat5 in _BCR-ABL_–positive cells. Another link between BCR-ABL and the inhibition of apoptosis might be the phosphorylation of the pro-apoptotic protein Bad. In addition to Akt, Raf-1, immediately downstream of Ras, phosphorylates Bad on 2 serine residues. It is also possible that Bcr-Abl inhibits apoptosis by down-regulating interferon consensus sequence binding protein ICSBP. These data are interesting because ICSBP knockout mice develop a myeloproliferative syndrome, and hematopoietic progenitor cells from ICSBP2/2 mice show altered responses to cytokines. The connection to interferon a, an active agent in the treatment of CML, is obvious. It becomes clear that the multiple signals initiated by Bcr-Abl have proliferative and anti-apoptotic qualities that are frequently difficult to separate. Thus, Bcr-Abl may shift the balance toward the inhibition of apoptosis while simultaneously providing a proliferative stimulus. This is in line with the concept that a proliferative signal leads to apoptosis unless it is counterbalanced by an anti-apoptotic signal, and Bcr-Abl fulfills both requirements at the same time. c-Abl function is tightly controlled in order to prevent oncogenic activity. Similar to Src, c-Abl is regulated by intramolecular interactions that keep the kinase domain in a closed and inactive conformation. In addition, these results uncover an unsuspected function for N-myristoylation. c-Abl is regulated also by phosphorylation. A phospho-proteomic analysis identified at least 12 phosphorylation sites on tyrosine residues, all clustered at the N-terminus. The function of Tyr245 and Tyr412 has been thoroughly analysed and mutagenesis has confirmed that these phosphorylation sites are required for c-Abl activation. Hence, growth factors, such as PDGF, use a tyrosine kinase signalling cascade (i.e. receptor/Src/c- Abl) to promote DNA synthesis. Rac further propagates signalling via the induction of NADPH oxidase and JNK ( Jun Nterminal kinase) activities to favour c-myc induction and cell-cycle progression.